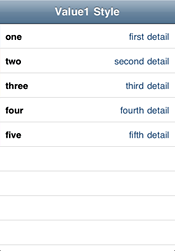 Table views are one of the most commonly used iPhone UI elements. 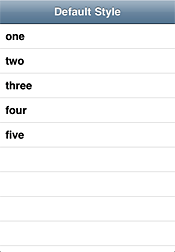 You can use a table view to display a scrollable list of information (which can include text and/or images). There are two types of table views: plain and grouped. A plain table view consists of a single list of items. A grouped table view can have multiple sections, with customizable section headers and footers. Each table view must have a delegate and a data source. The table view delegate must implement several methods that tell the app how the table appears and how it should respond when the table is scrolled or a cell is tapped. The table view data source must implement methods that tell the app how many rows are in the table, and the actual data to display for each row. Usually the view controller that contains the table view will serve as both the delegate and the data-source, although you can use other objects. For easiest implementation, you can create a UITableViewController subclass in XCode, which will include all of the required methods in the code template. The following methods are required from the data source: tableView:numberOfRowsInSection: and tableView:cellForRowAtIndexPath:. If your table is a grouped table, you must also implement numberOfSectionsInTableView:. 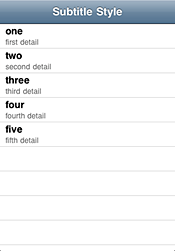 The default UITableViewCell has several standard data views and subviews that can be set in the tableView:cellForRowAtIndexPath: method. The contentView contains the cell's main content, and contains three subviews: textLabel, detailTextLabel, and imageView. UITableViewCell has properties for these views so you can set them directly. cell.imageView - a UIImageView that appears on the left side of the cell (all except Value2 styles). The optional accessory view may contain one of the following icons, or you can set the cell.accessoryView to your own custom UIView or UIImageView. 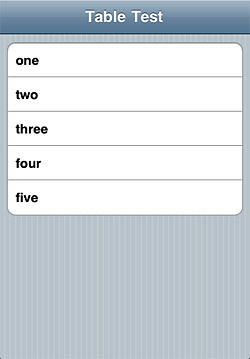 The default accessoryType is UITableViewCellAccessoryNone.